Tim was hired as a machine operator in November 1987 at Dana Perfect Circle in Franklin, Kentucky. The plant was organized and UAW Local 2370 was chartered in March 1997. Tim was a key member of the VOC and helped the plant become organized. He also helped organized Local 2407/Rane Precision Diecasting in Russellville, Kentucky and Local 3047/Metalsa Structural in Elizabethtown, Kentucky. In June 2007, Tim went on political leave from his plant to serve as a Zone Coordinator for the Kentucky State AFL-CIO governor’s race. From 1997 to 2008, UAW Local 2370 members elected Tim to serve in numerous positions; including the Bylaws Committee, Alternate Steward, Committeeman for two terms, and President. Tim has served on the Kentucky AFL-CIO Executive Board and was appointed to the South-Central Kentucky Workforce Developing Board that served ten counties in Kentucky. He has also been active in CAP and the Retired Workers’ Councils. Also, Tim is a member of the NAACP. Tim was appointed by then Region 3’s Director Mo Davison in January of 2008 as an International Representative. His assignment as a servicing representative in Region 3 included automotive and numerous automotive supplier locations (Dana, GM, Waste Management, IAC, Metalsa, Rane Precision Diecasting, and Rocore Thermal Systems) in Kentucky. 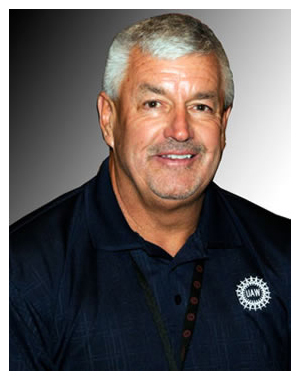 As part of the UAW restructuring of Region 3, Tim was assigned as a servicing representative in March 2012 by then Director Gary Casteel of Region 8. His assignment as a servicing representative in Region 8 included automotive and numerous supplier locations (GM, GMCCA, Fisk University, Carlex Glass, TRW, Hennessey, Cummins, Transtar, Faurecia, and Siemens). Tim was responsible for collective bargaining, arbitration, political action and other bargaining assignments. Tim also served as the Veterans Liaison for Region 8. Tim was appointed by Director Ray Curry to Assistant Director June 2018. Tim has been active for many years in his community. He has served as the President of the Auburn Junior Pro Basketball; President of the Auburn Little League Baseball; Assistant Coach of the Logan County High School Softball; and Booster President of the Greenwood Lady Gators Softball. Tim is a 1980 graduate of Russellville High School in Russellville, Kentucky and was a member of the first Russellville Football State Championship Team. He enjoys golfing, fishing, boating and exercising. Tim is a member of Crittenden Drive Church of Christ. He has two children; Zach Smith and Aeron Smith and lives in Bowling Green, Kentucky.